Hopkins prepared a comprehensive masterplan to guide development at the renowned museum into the 21st century. The museum houses an international collection of fine, decorative and applied art from around the world. The Masterplan suggested the reorganisation, reinterpretation and restoration of the listed buildings, on its South Kensington site. 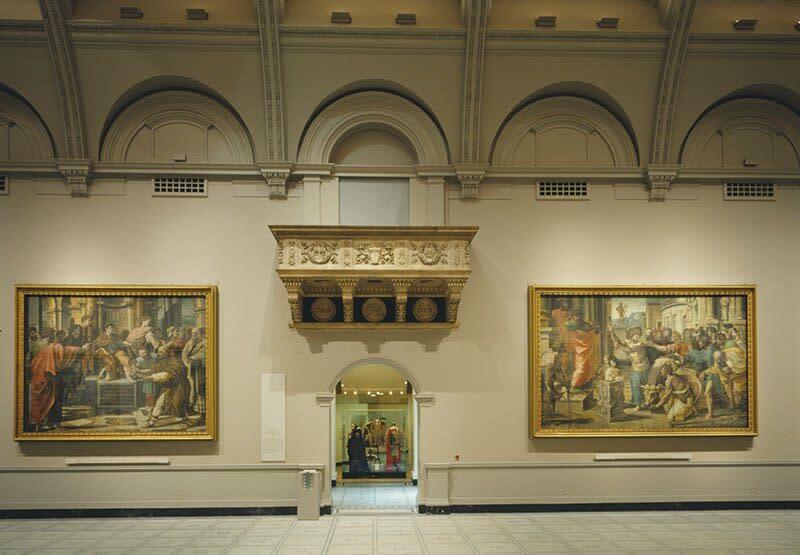 The first projects to be carried out in line with the Masterplan, were the restoration of the Long Gallery and the Raphael Cartoon Court. Opening the Long Gallery regained the legibility of Aston Webb's original plan. Introductory displays leading to the major world galleries are arranged along its length. The Raphael Cartoons, loaned by the Queen, were hanging on steel frames on false hessian covered walls, which compromised the space. These were removed, and the gallery was restored to its cathedral like splendour and the cartoons hung directly back onto the walls in their heavy gilt frames. Natural and artificial light in the Gallery are carefully controlled as is the humidity and cleanliness of their environment. A limited light is concentrated onto the cartoons so that they stand out dramatically and can be appreciated in detail for the first time.